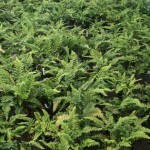 A handsome, dense, lacy evergreen fern. 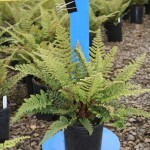 The fronds are dark green and somewhat coarser than P. setiferum. Requires shade and regular summer water; avoid soils that are poorly drained. Old fronds may be pruned back in winter. Use in shaded areas of the landscape in borders, woodlands, and wild gardens.